Shungite displays lots of healing properties. The ability of protecting a man against the electromagnetic radiation is among them. Attach the shungite plate to the mobile phone and forget that your phone is deteriorating your health. Shungite plate neutralizes the radiation coming from the device which is always within touch. Thin (just 2 mm) plate attached to the phone (dimensions: 2x3 cm) won’t trouble you. It won’t get dirty or become obliterated. 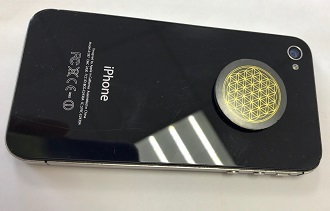 Shungite plates for mobile phones are an irreplaceable protection against the invisible enemy – electromagnetic radiation.